All Levels: Basically this is a Level 1 class. (see below) A perfect class for beginners. Higher level students will be challenged to go deeper into their poses. For more information, check out our locations page. Or to register, check the link for Hillcrest Park, directly. Level 1: A foundation for learning the whole scope and depth of the Iyengar method is taught in standing poses, shoulder stand, shoulder stand variations and other fundamental postures It is recommended that you study this level for 1 – 2 years. Level 1-2: This level is meant to be a bridge between pure Level 1 and Level 2 classes. Headstand is introduced. 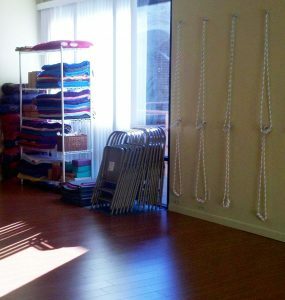 Level 2 and up: This class is for continuing students with at least 6 months Iyengar yoga experience. A deeper and expanded study of of the basic poses previously taught will be explored as well as intermediate and advanced poses. Headstand and shoulder stand variations will be practiced. Students must know how to set up for shoulder stand. No beginners. Gentle Yoga: Even though all yoga is gentle, this class is for those students that have special needs, ie injuries, medical conditions, etc that require modifications and a slower paced class. Restorative: The focus of this class will move away from rigorous physical work and focus the attention inward. The poses are held longer, with support, to allow the organs of the body to rest, offering recovery and a restored sense of tranquility. Pranayama, the art of breathing, as well as the art of sitting and meditation, will be covered in the class. Senior Yoga: This is a class for senior students and is held at Oasis Senior Center in Newport Beach. For more information, check out our locations page. Or to register, check the link for Oasis Park, directly. If you have any questions about your levels, please feel free to contact us at (714) 388-4328 or via email on our Contact page.